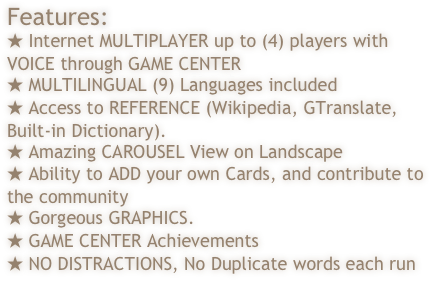 - No form or part of ANY word printed on the card may be given as a clue. 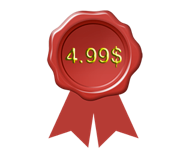 Examples: If the Guess word is PAYMENT, “pay” cannot be given as a clue. If DRINK is an "Unspeakable" word, "drunk” cannot be given as a clue. If SPACESHIP is the Guess word, you can’t use ”space” or ”ship” as a clue. 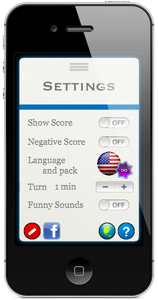 - No sound effects or noises may be made, such as explosions or engine noises. However, feel free to break out into song. 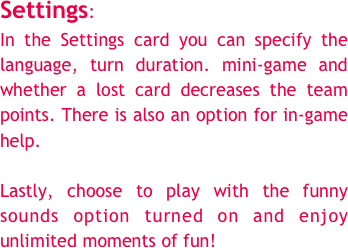 Taboo ™ is a registered trademark of Hasbro Inc. This product is in no way affiliated or endorsed by Hasbro and should not be confused with their product, Taboo, Taboo for Kids, Celebrity Taboo, electronic Taboo, Taboo Junior, Taboo for Kids, The Big Taboo, Taboo Body Language, Taboo Quick Draw, or any other similar product. 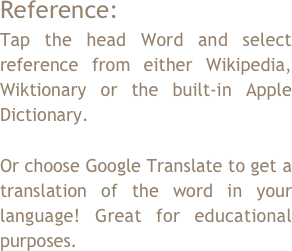 - You cannot say the Guess word "sounds like" or ”rhymes with” another word. 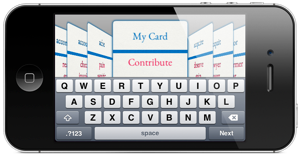 - No initials or abbreviations can be given if the words they represent are included on the card. 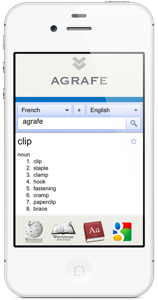 Examples: MD cannot be used if MEDICAL or DOCTOR is the Guess word or an "Unspeakable" word. 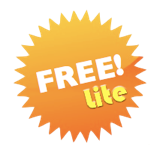 TV cannot be used if TELEVISION is the Guess word or an "Unspeakable" word. 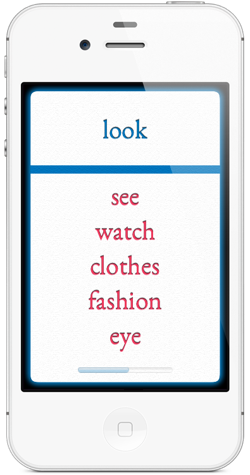 -As the Clue-giver gives clues, his or her teammates shout out possible words trying to say the Guess word. There is no penalty for wrong guesses. 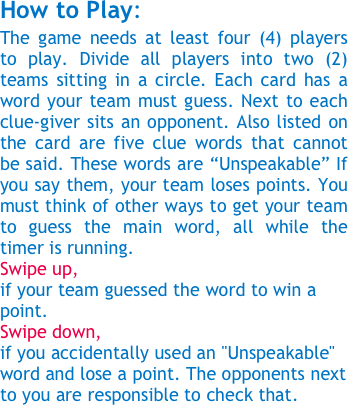 Note: This game cannot be played solo, you need an opponent to check whether you used the "Unspeakable" words or not. 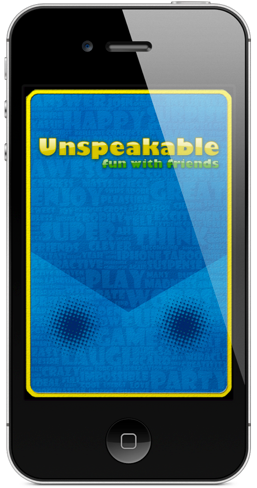 Unspeakable™ is a Taboo™ like game available on iPhone™, iPad™, iPod Touch™. 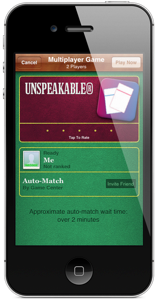 For those that like the original Taboo™ game, will find it so convenient to have thousands of Unspeakable Taboo™ cards in their pocket within their iPhone™, to play everywhere you want without the hassle. 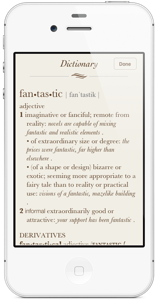 The dictionary and translation embedded in the application will supplement your fun with creative time and learning experience. 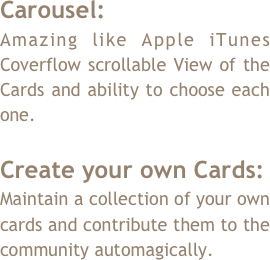 Use only one iPhone™ to play the Unspeakable™ Taboo™ like game and share the iPhone™ across the players. It is recommended to put a case on the iPhone™ to keep your iPhone™ safe. 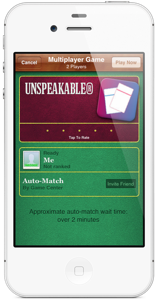 In case your friends are far away, feel free to find other Unspeakable™ Taboo™ players with iPhones on the internet, logged in to Game Center™, and play with voice!